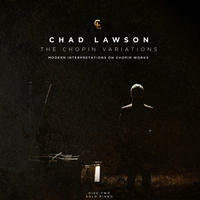 Chad Lawson : The Chopin Variations (on solo piano). Multi-award winning pianist and composer who is not afraid to put his hat in anything. Steinway artist, Chad Lawson, decided Frederic Chopin needed a new introduction. Along with violinist Judy Kang (Lady Gaga, Ryuichi Sakamoto) and cellist Rubin Kodheli (Kanye West, Courtney Love), Lawson has arranged ten Chopin works into a modern day interpretation. It's a risk editing the "poet of the piano" but one that Chopin would be proud of. Lawson's previous release, "The Space Between", debuted at #12 on Amazon's Adult Contemporary while Olafur Arnalds named it in his Top 5 of 2013. Prior to, The Space Between, Lawson's release, The Piano (2011), reached #19 on iTunes Classical. Chad has been a featured guest on NPR's Talk of the Nation, PRI/SiriusXM's Bob Edwards Show, toured with Julio Iglesias and can be heard on Delta Airlines In-Flight radio programming. License Multi-award winning pianist and composer who is not afraid to put his hat in anything by Chad Lawson for your project. Play the music of Chad Lawson in your restaurant or store.